This is about syncing phone app notifications from any app on your phone (not just your SMS text messages) - to your computer. By default, this feature is OFF. To enable it, see this article. You can now see your phone notifications from *any* apps on your Android phone directly on your computer! This notification will show up directly in the MightyText Web App, Chrome Extension, or Desktop App. You can immediately dismiss this notification on your phone. So, if you're busy working on something on your computer, and your phone buzzes and you have a notification, you can dismiss that from your computer, without having to get your phone out! You may want notifications to not sync from particular apps - it's quick and easy to turn these off. When a notification from that app comes into MightyText, just select "Stop syncing" and notifications. You can manage which apps to not sync notifications for under Phone -> Apps in the MightyText Web App. It might be handy to reference an app notification from your phone. You can now save it in your MightyText account. You can see app notifications under Phone -> Notifications in the MightyText Web App. Want to try it out? 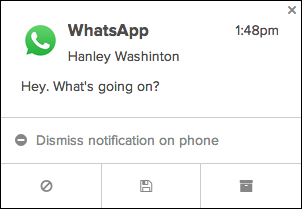 Follow these steps to enable app notifications in MightyText.